Hell bank notes are a more modern form of joss paper, an afterlife monetary paper offering used in traditional Chinese ancestor veneration, that can be printed in the style of western or Chinese paper bank notes. In Chinese cultures, the hell bank note has no special name or status, and is simply regarded and referred to as yet another form of joss paper (冥幣, 紙錢, 金紙). Regardless of the presentation, Hell Bank Notes are also known for their large denominations, ranging from $10,000, $100,000, $1,000,000 or even $500,000,000. In Singapore, it is extremely common to find 10 billion dollar banknotes in shops. On every bill, it features an image of the Jade Emperor, the presiding monarch of heaven in Taoism and his Western signature (Yu Wong, or Yuk Wong) countersigned by Yanluo, King of Hell (Yen Loo). On the back of each bill, it features a portrait of the bank of Hell." The word hell on hell bank notes refers to Diyu meaning "Underworld Court." In traditional Chinese beliefs, it is thought to be where the souls of the dead are first judged by the Lord of the Earthly Court . After being judged they are either escorted to heaven or sent into the maze of underground levels and chambers to atone for their sins. People believe that even in the earthy court, spirits need to use money. A story says that the word hell was introduced to China by Christian missionaries, who preached that all non-Christian Chinese people would "go to hell" when they died, and through a case of misinterpretation, it was believed that the word "Hell" was the proper English term for the afterlife, and hence the word was adopted. Joss Paper is used in some Asian rituals and holiday observances, and sometimes for Feng Shui. 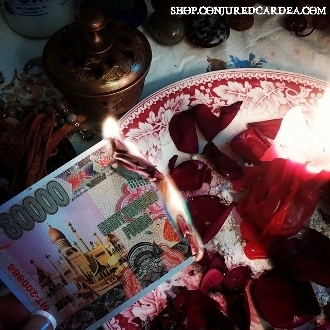 You can anoint one of these bills with your favorite wealth or luck oil from Conjured Cardea and then burn it to bring good luck and money to your home or business. Keep the ashes and add them to your mojo bag. You may also anoint with an appropriate oil and use as an offering to a deity or saint in order to petition them and receive their blessings. You will receive 5 notes. ***These may be mailed separately from your other items.